Marion W. “Bill” Rice, age 91, of Thurmont, passed away on Thursday, November 29, 2018 with his family by his side. Born November 12, 1927 in Mountaindale, near Lewistown, MD, he was the son of the late Marion Warfield Rice and Ethel Matheny Rice. During his school years, he was lovingly raised by his Mamaw and Pap, Emma and John Kesselring, of Thurmont, so he wouldn’t have to walk a mile to school in Mountaindale. He was the husband of Nancy Gearhart Rice. They shared 53 years together, always working as a team. He is also survived by son, James B. Rice, wife Mary and grandson Corey Rice of Rocky Ridge, and son Darren L. Rice and granddaughter Olivia Rice of Greencastle, PA. Bill was especially proud of his grandchildren and cherished their visits. He will be fondly remembered by Stacey Coleman and her family of Greencastle. Also surviving are sisters Audrey Demarais and husband Tim, and Joan Zahn and husband Bill; sisters-in-law Margaret Rice, Carol (Bob) Long, Janice (Moe) Snyder; brother-in-law Charlie Gearhart; and many nieces and nephews. In addition to his parents, he was predeceased by brothers, George (infancy), Harold E. Rice and Leonard F. Rice; sister-in-law, Doris Gearhart Kuhn; and niece, Shannon Zahn. 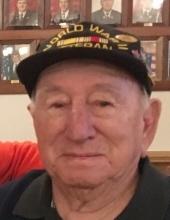 Bill graduated from Thurmont High School, class of 1944 and enlisted in the U.S. Navy during World War II, serving in the Pacific. Following his discharge in 1946, Bill took advantage of the GI Bill and furthered his education in electrical engineering. He was hired by Mayor Dubel as the Town of Thurmont’s electrician and lineman in 1946 and continued employment with the town for 42 years, retiring in 1988 as a Public Works Superintendent. While employed by the Town of Thurmont, he was a member of the American Water Works Association and was selected as Water Plant Operator of the Year in 1982. Bill loved talking to his friend Albert (Junie) Riffle about all their good times growing up in Thurmont. During the past 2 years, because of declining health and unable to walk, he was confined mostly to his home and lovingly cared for by his wife. Bill was a life member of the Edwin C. Creeger Post 168 American Legion, life member of the Guardian Hose Co., past member of The Brotherhood of the Junglecock, and a member of Weller United Methodist Church, Thurmont. Bill was an avid hunter and fisherman and enjoyed both sports until his late 80’s. He seldom missed being along the streams on opening day of Trout fishing. His last deer hunting trip was at age 89 when, unable to go alone, his wife accompanied him to his deer stand. He was a master woodworker and spent countless hours in his workshop creating many pieces of furniture for his home. He loved gardening and building fish ponds and would eagerly await each Springtime to start ordering seeds. The family will receive friends at Hartzler Funeral Home, 404 S. Main St., Woodsboro on Sunday, December 2 from 5 to 8 p.m. and on Monday, December 3 at Weller United Methodist Church, 101 N. Altamont St., Thurmont from 10 to 11 a.m.
A funeral service will be held on Monday at the church at 11 a.m. Rev. Bob Kells, his pastor, will officiate. Military interment will follow in Blue Ridge Cemetery, Thurmont. Memorial donations may be made to Weller United Methodist Church, 101 N. Altamont Ave, Thurmont, MD 21788 or Edwin C. Creeger Post 168 American Legion, 8 Park Lane, Thurmont, MD 21788. To send flowers or a remembrance gift to the family of Marion W. "Bill" Rice, please visit our Tribute Store. "Email Address" would like to share the life celebration of Marion W. "Bill" Rice. Click on the "link" to go to share a favorite memory or leave a condolence message for the family.